We all want fairness in the civil justice system. But how is fairness possible in a world where so many people cannot afford legal help? This short video provides an easy-to-understand explanation of what civil legal aid is, and why it matters so much. When you’re accused of a crime you have the right to a lawyer, whether you can afford one or not. But what happens when it’s a civil issue? Whether you’re facing something like foreclosure, not receiving your veteran’s benefits, or escaping domestic violence, if you can’t afford a lawyer, you might be stuck trying to represent yourself…. 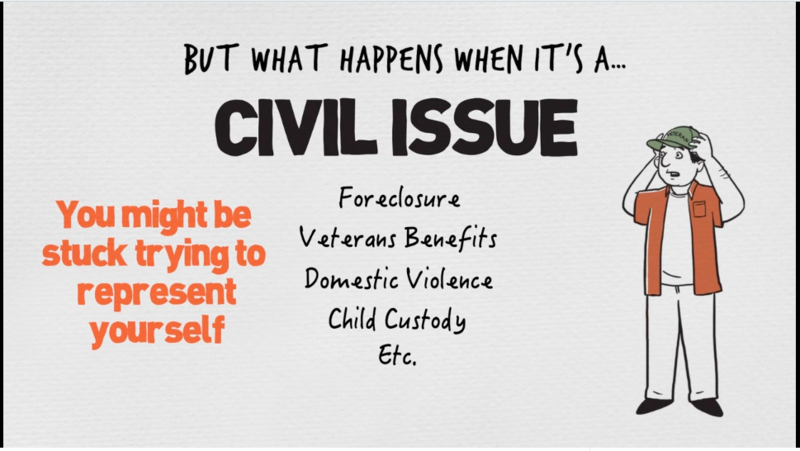 Civil Legal Aid Animated Video Explainer from Voices for Civil Justice on Vimeo.